Creating confidence when traveling takes three things, knowing the correct information about your chosen mode of travel, giving as much information about what your needs are when you travel with that type of transportation and practicing what needs to be said and done when it comes time for the planned trip. All this is done in the name of producing the best possible adventure. Flying can be one the most stressful modes of travel because of all the unique forms of distractions surrounding the path of travel to boarding an aircraft. Just the countless streams of sounds and visuals flowing throughout airports draw us in, diverting our focus, it’s wonder anyone gets to their gate on time to board the plane. I mentioned practicing as the one of three things to gain confidence because it builds confidence with repetition. And if we write down what our requirements are, how we want to say them and repeat them in front of some friends we’ll get feed back on how well we are understood. And being understood with the least amount of words, in a very short amount of time will make all the difference, positively, in how our travel day will unfold. Once the “speech” is ready, practice it in front of mirror; this will help create comfort in articulating with ease amid a fast paced, noisy environment. Remember, you must be proactive, don’t assume that airline employees know what you need, you must tell them and it’s in your best interest to follow-up with them making sure they understand what you need by mirroring with them. We learned how to mirror in Part One of this blog series. Pre-boarding gets you first on the aircraft and should, in an ideal world, give you time to settle in before the other passenger’s begin boarding. Once you’re in the boarding chair and entering the aircraft, say hello and introduce your self to the flight attendants, make sure everyone knows you’re coming on board. Ask the flight attendant to come by your seat, he or she should be able to locate the latch to release the armrest and lift it up for an easy transfer. About fifty percent of all the aisle seats will have armrests that move up out of the way for a level transfer on to the seat from the boarding chair. If the seat you selected doesn’t have this type of armrest, the flight attendants can change your seat, immediately. The best idea is to let the gate agent know, when you check in at the gate for pre-boarding, that you need a seat with a moveable armrest. This way there won’t be a last minute scramble to change seats while the rest of the passengers are trying to board the aircraft. Again, be proactive and ask! From here you can easily stay in the aisle seat or move across to the middle or window seat. I like a window seat, I’m out of the way and no one has to ask me that awkward question, please move so they can get out of the row. When a flight attendant comes to your seat, ask them if they know where the on-board aisle chair is and do they know how to put it together. 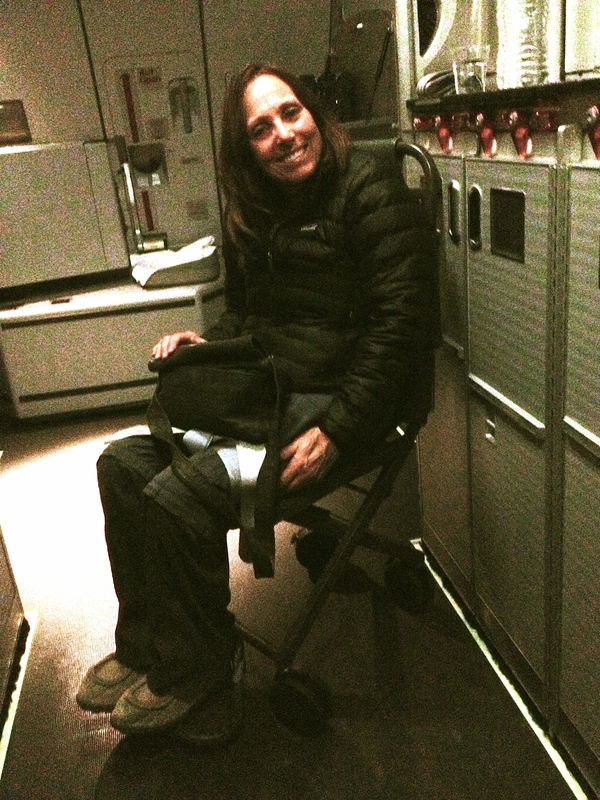 I have had several opportunities to use the aisle chair inflight and much of the time the flight attendants don’t know how to put the chair together. I have had to teach attendants how the chair goes together as well as how the accessible lavatories work. Just taking the time to ask them these questions creates awareness for them of their need to know about the equipment so we can all go to the lavatory at 36,000 feet. Also make sure all the flight attendants know you are onboard the aircraft, this is a safety issue for you and the attendants, and they all should know who you are and where you are onboard the aircraft. I’ve had many a flight attendant ask me why I wasn’t getting up to deplane after everyone has left the aircraft because they didn’t know I was waiting for a boarding chair to deplane, it’s just another awkward question that can be avoided by being proactive. If you are traveling with a service animal, you qualify for a bulkhead seat or any other seat with the moveable armrests. If you aren’t traveling with a service animal, then seats you have a claim to are “only” the seats with the moveable armrests. Keep in mind, you can ask for bulkhead, but they don’t have to give it to you if you do not have a service animal. When it comes time to get off the aircraft, you will be last off. This gives the ground crew time to get your wheelchair to door of the aircraft and for all the other passengers to deplane. Getting off the aircraft is just a reverse of boarding, but with a totally different set of service providers that haven’t heard anything you said to the last people. You will have to repeat your instructions and be proactive about what your requirements are. Take the time to carefully scan your mobility device for any damage. If there is any damage, this is the time to report the damage, if time allows. Keep in mind, you only have 30 days to file a complaint. 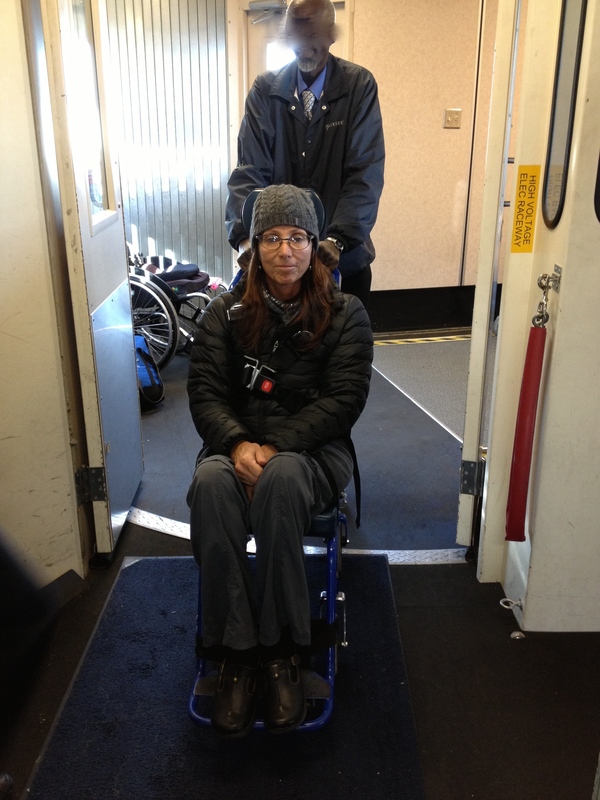 Traveling by aircraft has gotten simpler to access, but by no means is it easy when traveling with a disability that requires using mobility devices. But taking the time to create speaking points for all the conversations you will have along the path to the aircraft, will go a long way in creating solid confidence in your ability to get what you need and have an enjoyable journey.